Looks to be dead. "This code is invalid" for all three given codes, and on desktop and mobile. Also, the fares seemed really bloated from TAP's normally low prices. i thought so also but found a way to get it done by using the Portugal Stop Over Program. So something like JFK-LIS-CPH-LIS ( staying here 5 days ) - JFK for around $1000 USD. Nope. Tried an ex-Europe to Rio. Price went from 1,820€ to 940€. It really looks to me like they have inflated the prices before this promotion since i can't find any starting point in EU to Brazil under 2000EUR and i am pretty sure there were some. It's a big scam. I get the Google flight price and then add the 'promo code'. This gets accepted and it bumps up the price. Come on. What a joke. It worked ok yesterday. 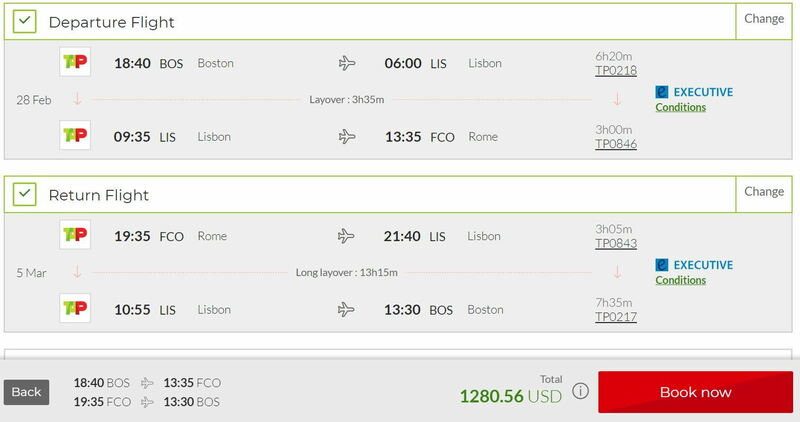 RT PRG-BOS for less than 1000 usd, but I did not book in the end. Can see lots of posts suggesting this doesn't work but I'm getting the discount on most routes. It's discounting the fare but not the YQ and the admin fee so total discount may not quite be 50% but I've just booked London to Miami in Business for under £800, which is half the normal price as I have been looking at it for weeks. You can drop the admin fee by signing up to an account and I had absolutely no problem doing that whatsoever, so can't explain why others have unless the sire was busier yesterday. It's fine now. The following comment isn't really relevant to this forum but as the thread title mentions Economy, the thread may get looked at by non-regular visitors. Anyone planning an Economy mileage run shouldn't expect to get full miles. I can't find a way of confirming the fare class but as soon as you apply the discount all Economy tickets become Discount tickets and only earn 10% TAP Miles, irrespectictive of what TAP Product they were originally. I imagine this would earn nothing in A3. This doesn't seem to happen with Business which stays as Executive or Top Executive (150 oe 200% TAP Miles respectively). I am still optimistically expecting 200% in A3 for my Miami trip. Let this be our learning experience that even experienced travelers are susceptible to mob mentality and limited availability claims. ZRH-LIS r/t in business for 230 EUR. That is very tempting. The first (!) flight needs to be in February, but the travel period has been extended until Dec 31. 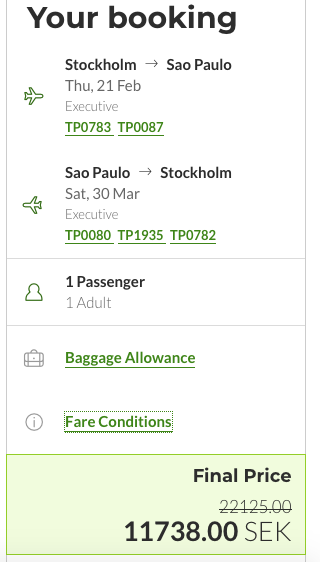 Germany to Brazil ~1000€, some routes on A330neo. Is that one-way? Because with the inescapable taxes+APD etc at close to £300, and another £350 for YQ, that's an extraordinary ticket price - a base fare of around 15% of the best "executive" fares I am seeing. The best priced, and readily available TAP ticket is DUB SFO at just under £1100. An of course this raft of dodgy codes have nothing to do with that.